The world of the old Anglo-Jews, who were a mix of the British Jewish way of being Jewish and the Anglican-style Englishness of loyalty to Queen and Empire, seems to be one of those lost worlds of the past. Reared on the poetic cadences of the Jacobean English of the King James Bible and the English literature such as Shakespeare was the inheritance of these generations of Anglo-Jews. It was a softer more dignified style of Judaism and Jewishness. Elliot's Daniel Deronda seems to embody this kind of English Jewishness. The Australian Anglo-Jews looked as much to England or Britain as their Mother Land as to Jerusalem. They looked down on the yiddish-speaking peasant Jews of Eastern Europe, yet now these two have both become part of the lost lands in the mists of history. The Apple Isle of Avalon merges with the Apple field or orchard of Jewish mysticism based on the imagery of the Song of Songs and Genesis. Some of my earliest memories are of my mother reading me the King James Bible and English literature and especially poetry. One of the poems she read to me was Alfred Lord Tennyson's "Lady of Shalott". Recently I was introduced to the sung version of "The Lady of Shalott" by the Canadian singer Loreena McKennitt. Always the legends of the Arthurian and Grail literature have resonated with something deep in my soul. 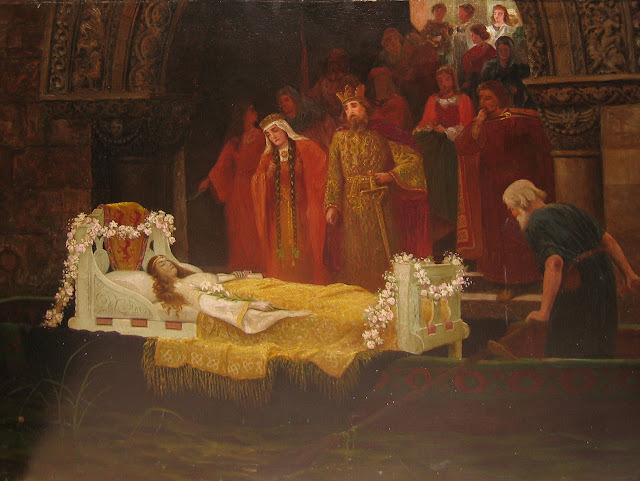 As further studies at University on Malory's "Morte D'Arthur" and "The High History of the Holy Grail" revealed that Arthur and the Knights of Camelot all claim descent from the Jew and Davidic descendant Joseph of Arimathea. Many Jewish elements are found in these tales. 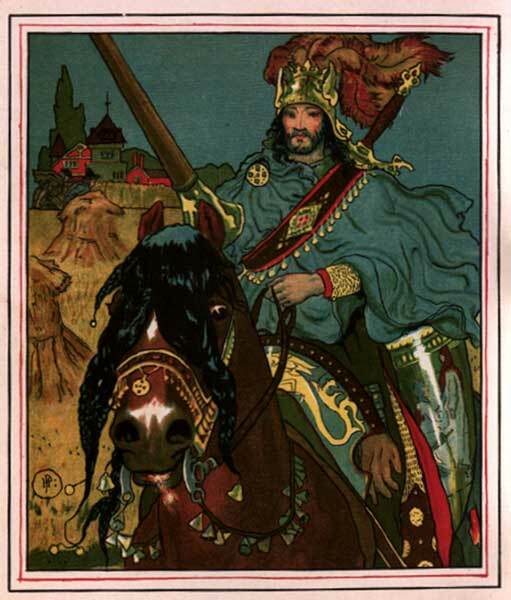 Also I discovered that Camelot comes from the name Camulon or Camelon (near Falkirk) which was a Scottish city of the Gododdin who were the Scottish descendants of the Jewish Christian Exilarchs who moved to the lands of the north and became known as the Gadeni to the Romans. 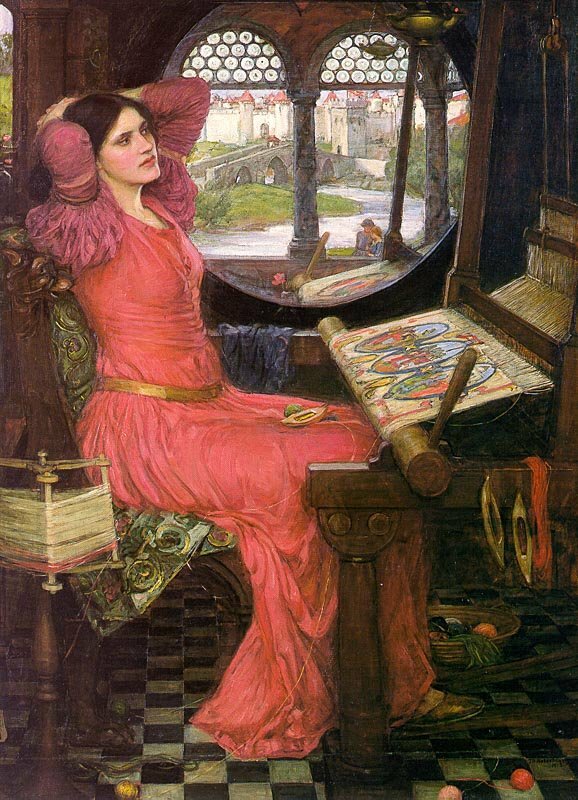 The Lady of Shalott is based on the story of Elaine who in other stories was the unloved wife of Lancelot and the mother of Galahad. She is also called the Donna di Scalotta which was the Italian memory of her name Scota or Scotia. She is also remembered as Elaine of Astolat or Ascolat as well as Elaine of Corbenic, Elaine the White and Elaine the Fair. 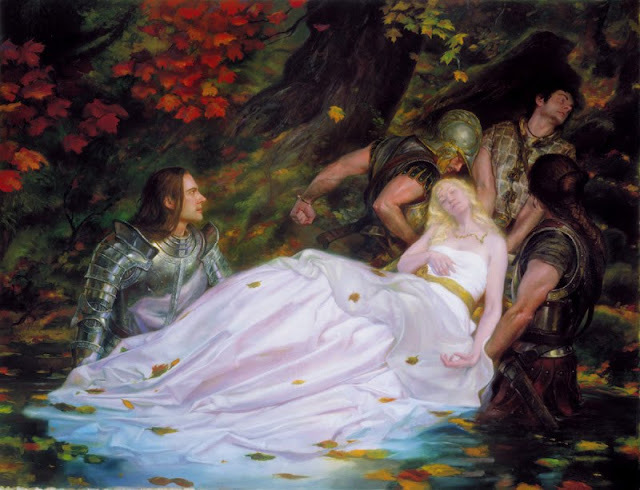 She is also associated with the Lady of the Lake in some legends and in others she is called the Grail Maiden or Grail bearer. The elements of the mystical mirror and the weaving of the tapestry alludes to the mysteries of the Grail and Kabbalah. David Nash Ford writes: "Tradition: In 1695, Gibson recorded that the old Roman Fort of Colania at Camelon, on the outskirts of Falkirk, was: "A little ancient city, where the common people believe there was formerly a road for ships. They call it Camelot. It may be gathered from history that this was the Palace of the Picts." About a hundred years previously, George Buchanan had recorded of the same place that "some of our writers falsely imagine (it) to have been Camulodunum". In 1522, Hector Boece had associated Colania with King Cruthneus Camelon of the Picts..."
Guarded the sacred shield of Lancelot;"